The Web is truly a great invention—right up there with the wheel and dashboard cup holders. But it wouldn’t be much fun if you couldn’t find anything on it—a distinct possibility, as it grows by at least five million pages a day. While more pages mean more information and media to meet your needs, they also mean that to find the good stuff, you have to sort through a digital pile that’s growing even as you search. It’s news to approximately nobody that Google is an awesome and hugely popular search engine. In fact, the good engineers at Apple like it so much that they built a Google search box right into the Safari toolbar—so you don’t have to hop over to www.google.com to run a Google search. Instead, just type your terms into the search box and let ’er rip. (If you’re interested in a Google toolbar that has a lot more features, take a look at Mozilla’s Firefox browser.) What few searchers realize is that Google has a lot of seldom explored—yet tremendously useful—features. 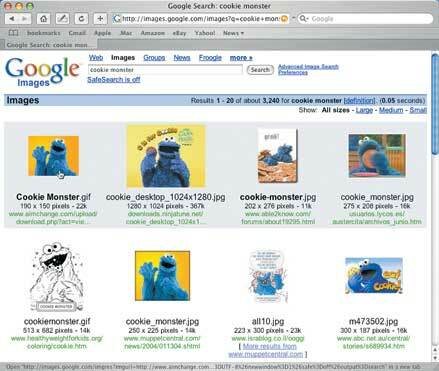 Find Images Fast If you want to find graphics on the Web—including photos, maps, cartoons, posters, and more—Google’s Images is a trove of 880,000,000 pictures you can search by keyword. To use it, go to http://images.google.com, or click on the Images link on Google’s home page. You can also run a regular search and then click on the Images link at the top of your results page to run that same search in Google’s image bank. Google shows you your results in the form of thumbnail images; click on one to view the page where Google found it. Get All the News Google also has a news site, which is constantly updated with stories culled from more than 4,500 sources. Of course, it’s a good place to find breaking news. But because Google News draws from so many media sites, its real benefit is that it lets you compare the way different outlets cover the same story. For example, you can easily see how New York and Boston newspapers approach the Red Sox-Yankees rivalry differently, or whether big-city media cover NASCAR adequately. and then press return, Google recognizes that you’re doing a calculation rather than looking for Web sites, and it shows you a results page with 2+2=4.
. You can find an excellent rundown of the calculator features at GoogleGuide, an unofficial Google help site.
. Google gives you a list of canine boarders near Boulder (click on the top link—in this case, Local Results For Dog Kennels Near Boulder, CO—to get a full listing). The yellow pages feature, called Local Search, is very handy for planning a trip or finding, say, a pizza place in an unfamiliar town. Google is also a reverse phonebook. If you type in a phone number, you’ll get a name and address. And if you type an area code, you’ll get a link to a map of the corresponding area.
. (Don’t worry about whether there’s a space after the colon—your search will work either way.) Second, to look up the status of a package delivery on a carrier’s Web site (FedEx, UPS, or U.S. Postal Service), simply type the tracking number into the Google search box. The first line of your results will be a link to the page about your package. Of course, Google isn’t the only search engine in town. Others can turn up different results or display them in ways that may be more useful to you. Vivisimo Most search engines show you your results as a fairly straightforward list. Vivisimo, on the other hand, clusters your results into categories, which is a terrific system for helping you find exactly what you want—not just something close to it. For example, if you search Vivisimo for the word volleyball, the site clumps your results into groups such as Equipment, Adult Leagues, Beach Volleyball, Rules, and so forth, letting you home in on the aspect that interests you. Even better, you can use Vivisimo to search specific sites, including eBay, whose own results are sometimes chaotic and hard to sift through. (The pull-down menu next to the search box lets you choose a site or sites to search.) Because Vivisimo’s results are so well organized, you can get both a great overview of what’s up for auction under your search terms and a direct path to the specific stuff you’re interested in. As you can see on the left side of the page, the search engine clusters your results by category. This search tool is a lot more sophisticated than eBay’s, and it lets you home in quickly on the goodies you want to buy. Dogpile Dogpile is a metasearch engine, which means that it runs your search through a bunch of engines simultaneously and then shows you the best results from each—a great efficiency trick (and it clusters results, as Vivisimo does). For example, when you want to find the top results of a search for the term “history of poker chips” from Google, Yahoo, Overture, Ask Jeeves, About, LookSmart and FindWhat, you can use Dogpile to search all of them at once—saving you trips to seven separate search engines. Dogpile also offers a twist: it can look for things Google can’t, namely audio and multimedia files. If you run a search for a song title in Google (or any other engine that looks for text), you’ll get a list of sites that mention that song. If you type in the same title on Dogpile’s home page and then select the Audio option above the search box, you’ll get a list of sites from which you can download that song. Yahoo A regular Yahoo search can sometimes unearth a page Google has missed. But one of Yahoo’s most useful features—a form that lets you search for particular kinds of information—is totally buried. If you run a Yahoo search, your results page has a Shortcuts link in the upper right corner. This takes you to a page with a slew of very specific search options, including area codes, traffic reports, weather, movie show times, exchange rates, and a whole lot more. Government www.firstgov.gov Thoughtfully designed portal to the astounding array of U.S. government sites. Health www.medlineplus.gov Run by the National Institutes of Health, with links to tutorials, clinical trials, and medical journals. Law www.nolo.com Indispensable, plain-language explanations of all things legal. Movies www.imdb.com Look up the cast, crew, and other details about practically every movie ever made—or search by person and find every movie or TV show an actor or director has worked on. You can also search for quotes from movies. News www.topix.net Very well-organized news from more than 7,000 sources. People www.accurint.com Surprisingly detailed information on individuals, but the site is not free. Reference www.refdesk.com A treasure trove of links to every kind of reference information available on the Web—from almanacs to opinion polls to zip codes. Words www.onelook.com Runs your search in 970 dictionaries at once; also does translations. Looking for something really specific—like the text of an appropriations bill making its way through Congress? Bypass search engines altogether and go to a site that focuses on your topic. Here are some good sites for finding specific kinds of information. A lot of people find that the hardest part of successful searching is training themselves to try a few different things. Get in the habit of testing different queries and alternative search engines, and soon you’ll be pulling needles out of the digital haystack every time.